Not only did Nintendo make a really good game in a new genre for them, but they made that genre family-friendly, a rare balance to strike even before having a huge amount of fun with the game. It seems that no matter how you slice it, shooter games dominate the landscape of interactive experiences today. From the massively popular Call of Duty series, to the enduring DOOM, Halo, Battlefield, and Wolfenstein franchises, you can’t really get away from shooters that seem to get more popular as the level of violence increases. Then, over in the corner, you have Nintendo. Generally perceived to make “kiddie” games — which is a pejorative for something accessible to all-ages — they’ve never really touched the shooter genre before, and there was no reason to expect that they ever really would. Then, last year at E3, they announced a game called Splatoon, and surprised everyone with something that looked like it relied on solid shooter mechanics, but was strangely non-violent. While it’s unlikely that Splatoon will take on the immense popularity of Call of Duty, that’s still no reason to overlook it. You’ll find much of the experience at least resembles the kinds of shooters you’ve played before, but a few very notable and highly creative differences exist that completely set it apart from everything else in the genre. Splatoon is more of a shooter by default than through some kind of bold statement of identity, and it’s the elements that make it different and how those have been melded with the existing framework of the shooter genre that makes this such a memorable experience. An Inkling girl using the most basic type of weapon in the game, the Splattershot. Splatoon has a very stylized look to it that seems to be informed by the culture of the 1990s more than anything else. There’s an “attitude” to the overall feel of the game, which is oddly accentuated by the bright colors and smooth lines that also tell you that this is a game for everyone. Characters speak in text boxes, and their dialogue is filled with a vernacular and type of slang that takes a bit of getting used to, but once you’ve played for an hour or so, it becomes really easy to follow. The first thing you’ll do when you start up Splatoon for the very first time is create your character, or “Inkling.” You can choose either a girl or a boy (and it defaults to girl, which is cool), before you then start to choose between some very basic sets of gear. You choose shoes, a top, and some kind of headpiece (a hat starts you off, with more types unlocked later). From there, you play through the tutorial which familiarizes you with the controls and fundamental concepts of movement that inform the game. It’s these things that set the game apart from so many other shooters. Played from a third-person perspective, Splatoonplaces you in the role of an Inkling: a being which can transform between humanoid and squid form at the press of a button. In humanoid form, you use ink-based weapons to shoot, roll, and splat against your enemies, and cover the surrounding territory in your color of “ink.” If you venture outside of your own ink color for too long — meaning just a couple of seconds — then you’ll begin to take damage and run the risk of being killed. If you have enough of your ink on the ground, that’s where squid form becomes the most useful. In your color of ink, you can hide and swim through the ink at roughly twice the speed that you can run through it. It doesn’t matter where your ink is, either: you can swim on the ground or up the sides of walls, as long as there’s a clear path for you to get from one ink blotch to another. Movement defaults to the Wii U GamePad’s motion sensor, but this can be turned off once you beat the tutorial. You can also call on the use of special weapons and perks, based on the gear that you’ve chosen and the weapon that you’ve decided to use. After you become familiar with some of the elementals of the experience, you can then jump into one of the game modes. There’s just one more stop you should make first. Here’s a look at Inkopolis, the Inkling city where players can purchase and upgrade weapons and gear, begin campaign or multiplayer game modes, and post to Nintendo’s Miiverse network. After the tutorial is finished, you emerge in Inkopolis: an area that you can explore to purchase and upgrade weapons and gear, as well as to enter either single player or multiplayer modes, as well as post to Miiverse, the Wii U’s social network. Within Inkopolis are some surprisingly strong character personalities, even though you don’t see them for very long in the whole experience. The shopkeepers for the stores selling headgears, tops, shoes, and weapons are all distinct and memorable, snapping sassy dialogue at you, or speaking in broken language or highly stylized slang. It’s here that you’re introduced to the different weapon types: shooters (basically automatic machine guns), chargers (similar to sniper rifles), and rollers (a giant paint roller with heavy close range damage). You begin the game with a shooter, and after playing a few games and leveling up, you can then purchase new weapon types. Inkopolis is a brief stop that’s secondary to the game modes, but it’s a nice touch and is just a taste of the unique creativity found in the game as a whole. After touring Inkopolis, you can then head to the creepy old man in the sewer for single player, or to Inkopolis tower to start multiplayer. In the single player mode – or “Hero Mode” – there is a story present, but like many Nintendo games it’s not the focus of the experience. As a young Inkling from the city of Inkopolis, you’re recruited by a mysterious and “creepy” old man Inkling named “Cap’n Cuttlefish.” We find out that the lovable old Cap’n is a “veteran of the great Turf Wars” that took place a long time ago between the Inklings and the evil Octarians, an evolved group of Octopuses that have been in conflict with the Inklings for a very long time. In the game’s story mode, the Octarians have stolen the “Zapfishes:” electrically charged fish that provide power to the city of Inkopolis. The “creepy” Cap’n Cuttlefish is your go-to boss inside the single player mode. The game itself called him creepy, not me! Cuttlefish takes you under his wing and gives you the rank of “Agent 3″ in his organization, and enlists your help in rescuing the Zapfishes from the Octarians, and restoring power to the blinking Inkopolis. From there, you embark on 27 regular levels and against a few bosses as you smash through the Octarians, and hone your skills as an Inkling. While the first few levels are pretty easy, they progressively get more challenging, causing you to get pretty creative with your tactics in laying down ink, and in disposing of your enemies. All in all, the single player campaign is only about 5-6 hours long, but it’s an enjoyable stretch of time. Each level also includes a hidden “sunken scroll,” that provides fun little anecdotes on everything from the Inkling culture, their evolution, and the Great Turf War (which the Inklings almost lost, for instance, because they couldn’t wake up early enough). From there, though, it becomes time to start honing your skills in the multiplayer mode. In “Battle Dojo,” you square off against a friend sitting on your own couch. One player uses the Wii U GamePad as both controller and screen, while the other player uses a separate peripheral like the Wii U Pro Controller and looks at the TV. It’s a one-on-one game, where you’re tasked with going to a specific spot on the map and performing destroying more balloons than your opponent. If you or they get “splatted” (i.e. killed) by the other player, they lose half their points and have to make that up by destroying balloons. In “Turf War,” the object of the game is very simple: cover more of the map than the opposing team. The game is played with two teams of four players each, and is messy, outright mayhem. While kills do count partially for your score, the more strategic use of killing enemy players is in getting them off of the game map for about 10-15 seconds. You see, Turf Wars have a time limit of only 3 minutes, so while killing adds a notch in your belt and a minor boon to your score, the major focus of the game is to just cover the map with your team’s ink. You accrue more points for yourself and your team by covering enemy players’ ink or by covering untouched ground, and taking enemy players off of the board simply meas that there’s more time for you and your team to cover the map with decreased opposition. 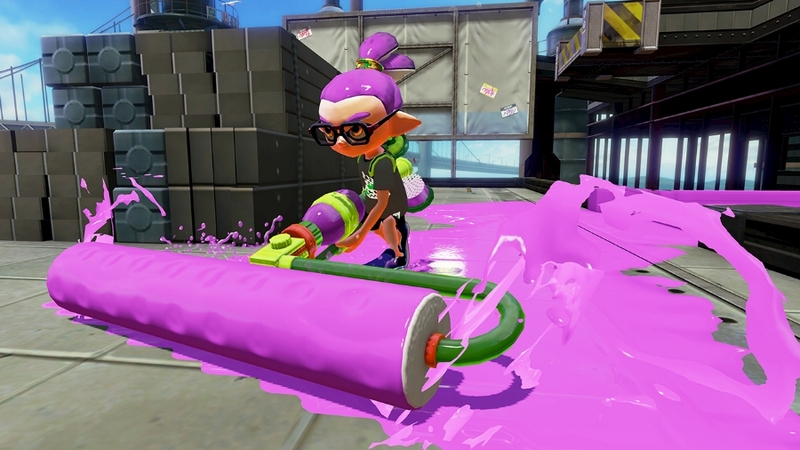 An Inkling boy using an ink roller, one of the most devastating — but vulnerable — weapons in the game. There’s definitely elements of strategy as well, based on the weapons you choose. One of the decisive factors can also be your ability to hide inside ink as a squid, waiting for a rival team member to come at you as you pop out and try to splat them off the map. Whether you win or lose, you earn experience points and can increase your Inkling’s level. The other game mode is “Ranked Battle,” unlocking for any players at level 10, and leveling up your ranking is based entirely on you and your team’s skill. Wins increase your overall rank on a grading scale from “C-” to “A+,” and only wins can earn you experience points. Right now, the only Ranked Battle mode is “Splat Zones,” which should be familiar to anyone that’s played “control” or “hardpoint” game modes in other shooter titles. Here, there’s only one major zone that needs to be controlled, and it’s downright difficult to try and hold the zone from the onslaught of the opposing team. Either way, it’s fast-paced and challenging, with the all-ages friendly tone giving way to a game that’s easy to learn, but difficult to master. If you’re one of the rare few who managed to secure the Splatoon Amiibos — Nintendo’s small figurines with near-field communication (NFC) chips in their bases that can unlock new content in Wii U and 3DS games — they can unlock new single player challenges that, when completed, give access to new armor and weapons. The challenges are basically single player levels with new weapons, though, and don’t greatly impact the experience online or offline. 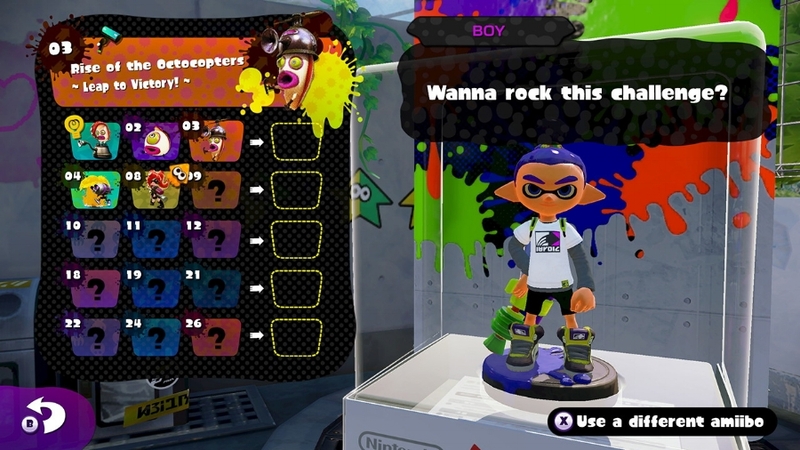 Using the Splatoon Amiibos — if you can find them — can unlock additional challenges, which reward you with exclusive gear. Although these are the only game modes available at launch, Nintendo has promised a plethora of new game modes and weapons that will become available later in the summer. Unlike many other gaming publishers and developers can say, this additional post-launch content will be offered free of charge to anyone that owns a physical or digital copy of the game. The new modes seem to be geared toward playing with friends, and give new options for people on your Wii U friends list to team up with you and take on opposing pre-assembled teams. While Splatoon as an online experience works very well in comparison with other online-based Nintendo games like Mario Kart 8 or Super Smash Bros. for Wii U, in comparison with competitors like the Xbox One or PlayStation 4 the online infrastructure leaves a lot to be desired. There’s no voice chat option present in Splatoon on any level, which can make it very difficult to coordinate any tactics with your teammates. Additionally, joining up with a friend doesn’t guarantee you’ll be on the same team, but one of the game updates will open this possibility up. I don’t hold these things against the game that much, though, because it’s expected from Nintendo at this point. This isn’t the fault of the game developers as much as the philosophy behind the team that manufactured the console. The game developers at Nintendo are concerned with only one thing: making fun experiences fit the hardware, and in this instance, they’ve definitely succeeded. This is just a taste of the multi-colored mayhem that you have in store if you play this game. Splatoon is a phenomenal game, and though I may have been skeptical about a developer’s ability to pull off an “all-ages shooter” very well, I’ve been completely disproven. It has the virtues of being accessible to anyone that wants to play, while still being intricate enough to get the blood pumping in heated sessions. As a new IP from Nintendo, it’s stellar, and likely has a solid chance at becoming just as identifiable with the “big N” as Mario Kart or Super Smash Bros. because it brings that same level of quality and intuitive design to the forefront of its experiences. If you’re a Wii U owner and a fan of shooters, then this is a no-brainer: pick this game up, and you will definitely have a blast. If you don’t own a Wii U — which many of you out there don’t — this game may be enough to warrant a purchase of the console on its own, especially if you’re already on the fence about picking one up. In a nutshell, Splatoon is a wonderful, multi-colored splash in the pond of a genre that can be a little too tepid at times, and for my money, that makes it a first-rate experience. Nintendo’s done it again, and this time, they’ve done it completely out of left field.